Far out in the North Sea, 150 wind turbines will rise from water depths of up to 37 metres and constitute one of the world’s largest wind farms. Ramboll has designed the monopile foundations for the Gemini offshore wind farm that will supply more than 1.5 million Dutch citizens with renewable energy in 2016. 85 km from the coast of Groningen, in the Dutch part of the North Sea, one of the world’s largest wind farms is being constructed. The vast eco-friendly energy source will reduce CO2 emissions in the Netherlands by 1.25 million tonnes per year, and the project therefore plays an important role in realising renewable energy targets set by the Dutch government and the European Union. The 150 wind turbines are developed by Siemens and have a production capacity of 4 MW each and a total capacity of 600 MW, producing zero CO2 emissions. Gemini will supply electricity to approximately 1,540,000 people, or 785,000 households, which equals the total population of the three northernmost Dutch provinces of Groningen, Fryslan and Drenthe. With an annual production of 2.6 TWh, no other wind farm in the world can match the amount of electricity that Gemini will produce. 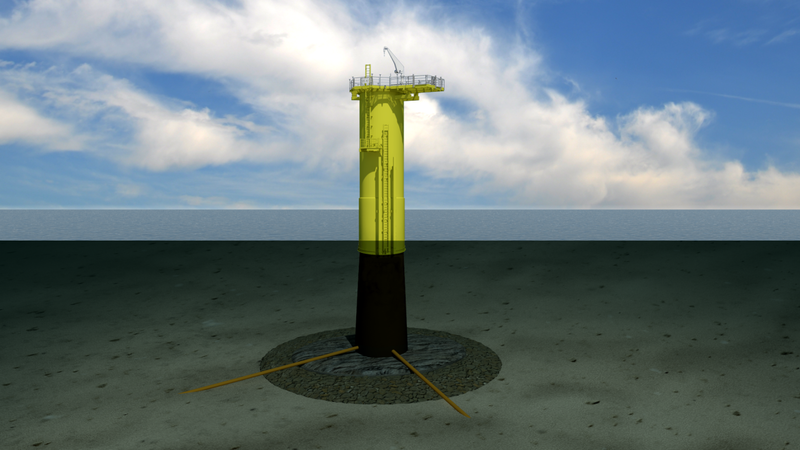 Ramboll’s wind and tower specialists have worked together with the company’s geotechnical experts to develop the detailed design of the monopile foundations. - Perhaps our design looks fairly simple when finished, but each platform, ladder or other construction part is considered thoroughly. We seek to minimise all risks, we have great experience in the field, and our portfolio of solutions widens with each project, says Klaus Andersen, Head of one of Ramboll’s Wind & Tower departments. - When it comes to experience and know-how, we are right at the top. In this industry, where projects demand particularly high investments, it isn’t about claiming what you’re able to do, it’s about being able to document your skills through previous experience, says Klaus Andersen. At water depths of up to 37 metres, the 150 wind turbines convert wind energy into electricity. The electricity is transported via a network of cables to two offshore substations. Two 120 km long export cables then transport the electricity to the transformer station in Eemshaven where the electricity is converted into high-voltage current, before it is transported to the high voltage station Oudeschip and the national grid. - Together with Siemens, we have designed a monopile concept that nobody thought possible just a few years ago. This is important for the effectiveness of the Gemini project, but also for the entire offshore wind industry. It proves that even at these depths and conditions it is possible to save costs and maintain safety by applying monopiles instead of having to apply a more expensive deep water concept, as we see in the oil and gas industry. It is interesting to be part of such a pioneering project that helps push the limitations of monopiles into deeper waters, says Klaus Andersen. The massive Gemini wind farm will stand invisible from shore. After three months of operation, the wind farm will have generated enough clean energy to compensate for any emissions produced during construction. The installation of the monopile foundations will begin during summer 2015 and is expected to be operational in 2016.